As a direct sales consultant you might already be holding online facebook parties for your business or you might be wondering where to even begin with holding an one. 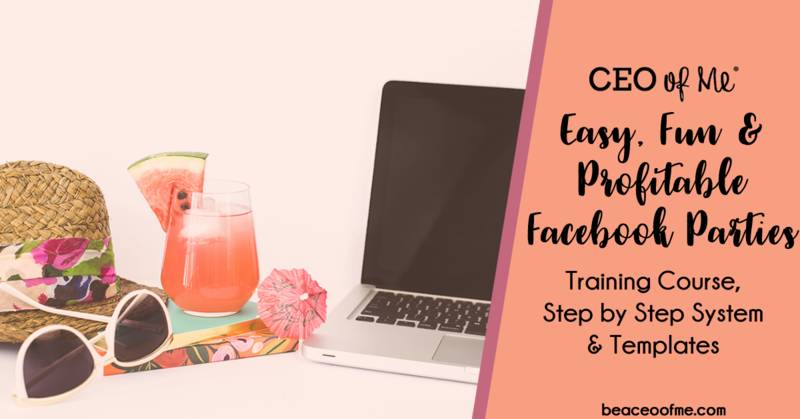 Today I want to share 4 simple tips to keep in mind that will help you improve your direct sales online facebook parties for everyone involved. 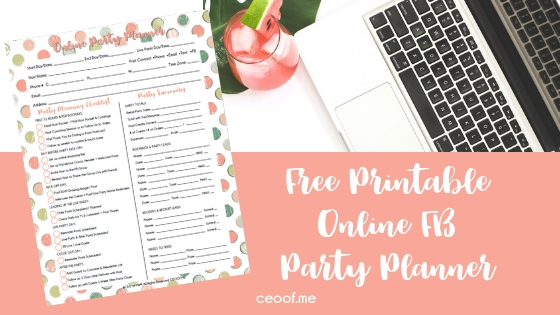 Plus, I’m sharing my Facebook Online Party Planning Checklist and Planner Page with you for FREE too! It’s all about the experience! Think about how you can make your online parties a better experience for everyone involved – the host, the guests and even yourself! If your hosts feel like you are partnering with them for their success and your goal is to help them earn their wishlist for free and have a great time, they are going to be more likely to do their part as a host too! Your guests are giving up their time (and hopefully their money) to listen to or watch what you have to say and share during the party. Make it worth their time & money! Use your unique personality, skills and passions to make your party something unique and different from all the same ol’ same ol’ text and image / copy & paste parties others are throwing. Think about what you do at your home parties and how you can incorporate that into your online parties. How can you make it more personal, more unique and more fun for the guests? As a consultant to have better parties: be more organized, create a system for your online parties and treat your online parties like you are a professional. If you are doing your parties on Facebook, have your hosts invite people to the group on FB by sharing the LINK to the group along with a message that you can type up for her to use and having people request to join the group. Encourage your hosts to personally inviting 40-50 people by email, FB message or text. This will help increase the # of people who RSVP going and who actually participate. Make sure to let your hosts and guests know that is not appropriate or considerate to just add their friends to the group (and make sure you are not doing this either.) This is very rude and annoying and it really gives direct seller’s a bad reputation when you do this. Ask your host and guests to share the link to the group and have those who are interested request to join the group, then you as the admin can approve them. Use video and Livestream to build a relationship, trust, credibility and authentically market yourself and your business in your online parties. Don’t be afraid to record short videos of yourself demonstrating different products or sharing helpful tips and information that you can share throughout the party. With FB Live, Youtube Live, Zoom and other platforms you can also do a LIVE party demo for your guests now too! This will really help increase your sales, bookings and recruits and make your party much more fun and unique! Don’t forget to follow up. Don’t just let the party end and be done with it. Make sure to send thank you notes to everyone who ordered. Message, email or call everyone to follow up and make sure they are happy with their order and offer them your other services. Send the host a thank you note too and invite the host to book a future show or to join your team! You can create a simple drawing form online using Google Drive that everyone can fill out so you have their contact info and find out their interest in hosting a show or joining your team and other questions like their wishlist items, birthdays and more. (Think of it like the paper drawing slips you use at your home shows.) Then be sure to follow up and invite them to your VIP group or to be on your newsletter list or birthday bonus list or whatever you offer to continue to build the relationship after the sale. You can also download my Online Party Checklist & Info Page for FREE below, just enter your email and I’ll send it right to you! To learn how to use the page and an easy, fun and profitable online party system, flow and set up to have more guests participating, more orders, party bookings and recruits, be sure to grab my Online / FB Party Success System Course & Toolkit here too! Holding online parties does not have to be super stressful, overwhelming or boring. They should be fun and easy for you, your hosts & your guests! As usual you give wonderful, helpful information. I will be doing my “1st” FB Live Party in a week and this has been helpful. Still spreading my “techy” wings so I’m not familiar with Google Drive and creating forms. I presume there’s a video on YouTube? lol Have you used this? Thanks again for all the support you give to us Misty!!!! !